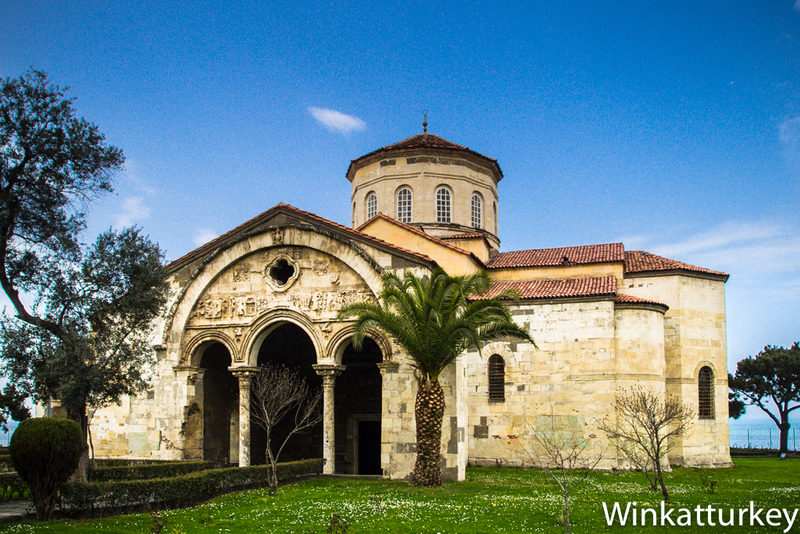 In 1263 completed construction of the most beautiful Byzantine church that was built in the current Trabzon. Near the city center and in an elevated area from which you can admire the Black Sea coast, the cross-shaped building is accompanied by a bell tower surrounded by gardens. Inside there are valuable frescoes and mosaics were restored in 1964. The 5 July 2013 will be remembered with sadness for lovers of art and history because, after being a museum for 49 years ago, the authorities decided to convert the building into a mosque again. To give such use, the painted ceiling and walls were covered with curtains, floor mosaics have been under the carpet and you can not admire the dome. From the belfry of Italian inspiration, now called the faithful to prayer in a neighborhood where residents say half of the mosques are empty. Hagia Sophia was built between 1238 and 1263 during the reign of Manuel I. Back then Trebizond was an independent empire of Byzantium and the church was designed to be the cathedral of the capital. It is a beautiful example of late Byzantine architecture, with a dome supported by four arches and external cross with two porches on the north and south sides. His frescoes depicting scenes from the New Testament and under the dome is a valuable opus sectile multicolor. In the south porch are represented images of Genesis. In 1427 The bell tower was built next to the church, It is also decorated with frescoes. When Mehmet the Conqueror took the city in 1461 ordered the building was converted into a mosque and the frescoes were covered with lime. However, in subsequent 400 years ago, The building suffered a progressive deterioration and 1868 had to be restored because of their poor state of repair. During World War II, Trabzon was occupied by the Russians, who used the building as a makeshift hospital. Between 1958 and 1964 the church was restored. The building underwent consolidation works and frescoes were newly discovered with the help of experts from the University of Edinburgh and the Directorate General of Foundations. In 1964 was reopened to the public as a museum and remained so until 2013. In December 2012, court ruled in favor of Vakiflar, Directorate General of Awqaf in charge of the conservation of historic mosques. The statement said that the building is part of the legacy of Mehmet II and stated that the Ministry of Culture had illegally occupied the place to use as a museum. Party officials of the current government ordered the conversion of Hagia Sophia into a mosque after the relevant reforms and was reopened to the Muslim religion coinciding with the first Friday of Ramadan 2013. The decision has caused much controversy in academic circles worldwide and Turkey itself. The value of the paintings now covered and the disappearance of the protection enjoyed by the place thanks to their status as museum, of great concern. Now admission is free, No guards, no one to take care to protect the integrity of this valuable cultural heritage. Even the merchants of the area and the tourism authorities have initiated action to reverse the decision which has deprived the city of one of its main attractions. We hope you will finally find a formula that return to enjoy this beautiful monument. Surely, a place that offends Muslims for his paintings, decorating their floors, even the very building cross, is not the right to practice prayer and could be left to be used for other purposes. Controversy aside, Hagia Sophia in Trabzon is a recommended visit so magnificent building and its surroundings. The logo of the European Olympic Youth Festival 2010 peeking through the fog covering the mountains around Trabzon. The fact that the transformation of this monument in a mosque is a real shame, result of a policy of religious imposition and destruction of secularism of Ataturk, because as mosque does nothing and space museum was not as secular as church. A heritage to create something that has little historical value is lost and sure there are dozens of mosques in Trabzon. In fact when I read turkish airlines magazine article talking and left me stone, not as a Christian but as a lover of art, there are people with this kind of thinking is very scary.